Our Whitefish Formula comes from the fish that are found in the cold waters of the Pacific Northwest and Alaska. 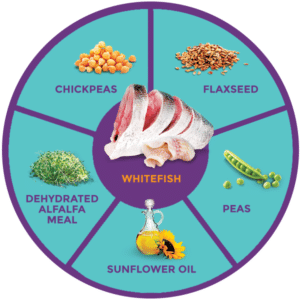 Whitefish is not oily like Salmon, but it still contains heart healthy Omega-3 fatty acids, as well as vitamins and minerals for a healthy, happy dog. Whitefish is a rich source of Niacin, Phosphorous, and Selenium. And our recipe is completely grain free, providing a hypoallergenic option for those dogs that may have food sensitivities or allergies. Zignature® Whitefish Formula – Learned from Nature, Crafted to Perfection. Whitefish, Whitefish Meal, Peas, Chickpeas, Pea Flour, Sunflower Oil (preserved with Citric Acid), Flaxseed, Dehydrated Alfalfa Meal, Natural Flavors, Salt, Minerals (Zinc Proteinate, Iron Proteinate, Copper Proteinate, Manganese Proteinate, Cobalt Proteinate), Potassium Chloride, Choline Chloride, Taurine, Vitamins ( Vitamin A Acetate, Vitamin D3 Supplement, Vitamin E Supplement, Niacin, d-Calcium Pantothenate, Thiamine Mononitrate, Pyridoxine Hydrochloride, Riboflavin Supplement, Folic Acid, Biotin, Vitamin B12 Supplement), Lactic Acid, Calcium Iodate, Sodium Selenite, Preserved with Mixed Tocopherols.